‘Bienvenidos Eco-Jardin Tematico El Explorador,’ pronounced the sign as I stopped to catch my breath. I had set off on a gentle hike from Boquete, the small mountain town at the base of the Chiriqui Highlands, in search of the eponymous garden 45 minutes previously and it was clear I had reached my destination. I checked the sign again. There weren’t too many eco gardens in this particular corner of Panama but I wanted to be sure, nevertheless. This time, however, it had changed slightly; beneath the lettering there sat an upcycled frog, its eyes bulging with a grin as wide as the valley beneath. The sight took a few seconds to sink in but I accepted the warm, if slightly surreal, welcome. This would be unlike any garden, eco or otherwise, I would have experienced before. 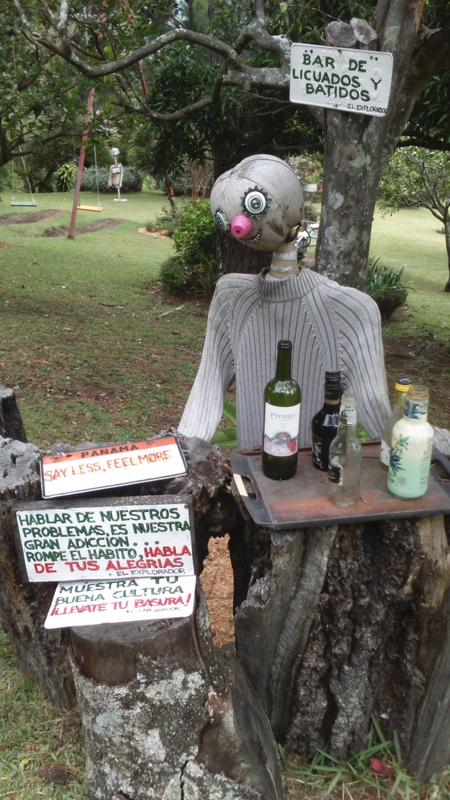 The premise of El Explorador is simple: the open garden lets visitors soak up the cleansing highlands atmosphere. Its philosophy seems to run thus: ‘La felicidad no se encuentra… se construye dia a dia.’ Happiness is not found… it is built day by day. In El Explorador’s case, happiness is built as if channelled from a fever dream. The short climb into the garden indicates something different is on the horizon: a series of flower pots, each decorated with wide-eyed grins, add a slightly disconcerting edge to proceedings. As I reached the garden itself I stood transfixed as the ethereal strains of a Debussy melody ebbed and flowed. Lost in a daydream I swayed gently to the passing breeze as El Explorador begun to cast its spell. Time had all but disappeared as I floated around the garden. Whether it was the old TV screen, emptied out and replaced with smiling paintbrushes, or the oversized swing-set, or any of the myriad surreal images, El Explorador excelled in replacing the mundanity of everyday life with the innocence of childhood. I had the feeling L Frank Baum was just around the corner in search of inspiration for his Oz series. The same grin and inviting eyes could be found everywhere: even the trees and bins seemed to be lulling me over with their giant smiles and coquettish gaze. Further exploration uncovered even more unexpected delights. 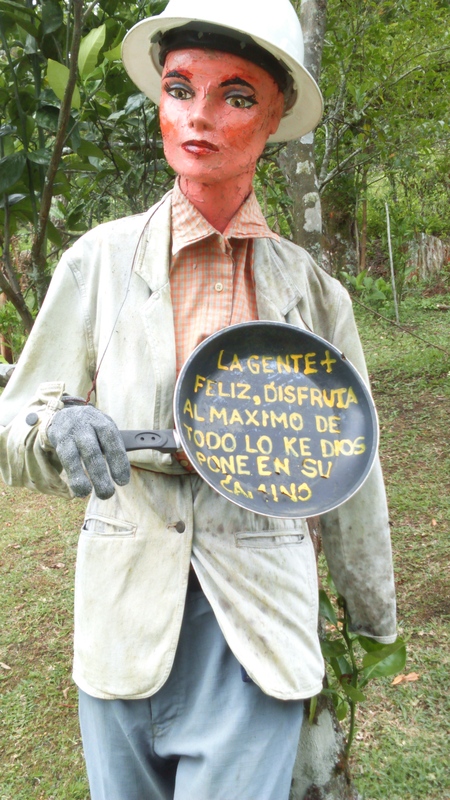 A makeshift model barman held court in front of an empty bar, while another mannequin, painted bright pink and dressed in workman’s helmet and gardening gear, held up a frying pan bearing the legend ‘La gente + feliz, disfruta al maximo de todo lo ke dios pone en su camino’. 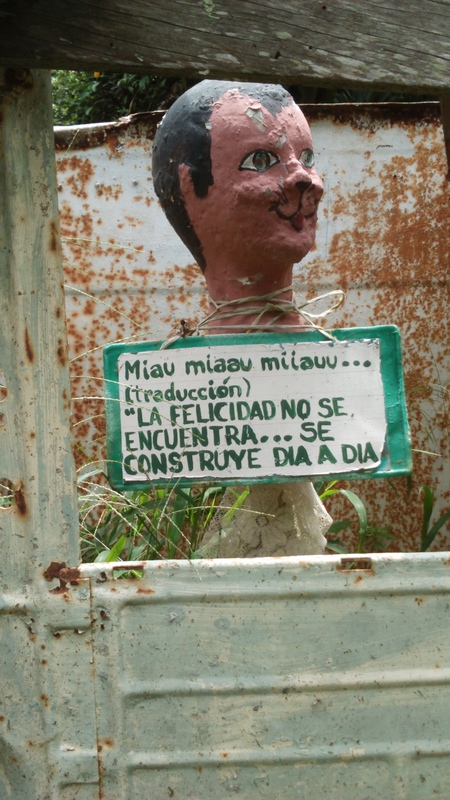 Loosely translated, happy people enjoy everything God puts in their way. I looked at the figure’s face and it stared back at me, knowingly. Unfortunately, as Debussy turned into Rachmaninoff, reality had started to make itself known once more and as I surveyed El Explorador a final time I felt sure the figures had gathered to bid me farewell, their countenances divine and their mouths eternally grinning. Tagged America, Backpacking, Boquete, Central America, Classical music, Culture, Eco garden, El Explorador, Garden, Panama, Travel. Bookmark the permalink.